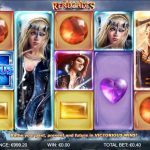 Five beautiful women in Renegades video slot game from NextGen Gaming can make our day. They will bring justice to the world and if it is necessary they will break couple of laws and rules. Join these powerful women and learn how you can earn cash the easy way. You will notice that there are some different symbols in Renegades. With every spin 2 or 3 reels may lock and create larger symbols that can be up to 3×3 reel positions. Then, we have the wild symbol which substitutes for every other symbol to complete a winning line. The only symbol it cannot substitute is the bonus icon. The icy blue bonus icon on the other hand is the key to the main feature, free spins round. You need to land 3 symbols to receive 8 free spins. 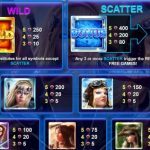 During the free spins only one of the girls will appear on the reels helping you create more wins. The good news here is that the feature can be re-triggered too. 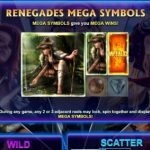 We are always on the lookout for new and exciting games and the latest addition to the NextGen Gaming portfolio, Renegades video slot game caught our attention. The first thing we noticed was the beautiful design of the game. The large icons can bring some good wins to your balance. The game play is straightforward with a unique and entertaining theme. There are a couple of features that will make the game play even more interesting and profitable to you. The betting options are wide and every kind of a player will find the right bet size for them. So even if you are a low roller or high roller you will find the right bet size that suits your bankroll. For another great engaging game you should consider playing Ramesses Riches a 5 reel slot by NextGen.